Inorganic and Composite Fibers: Production, Properties, and Applications provides a comprehensive review on the development, production and application of modern inorganic and composite fibers. Particular emphasis is placed on current production processes, parameters and finishing and functionalization methods for improving their properties and the problems associated with the testing of fibers. Fibers covered include carbon, glass and basalt fibers, metal fibers, such as copper and steel, fibers coated with silver or gold, and nitinol. In addition to pure inorganic fibers, the book looks at organic fibers with a high level of inorganic content, such as cellulosic fibers. 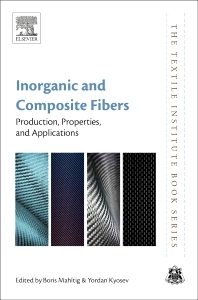 Including contributions from leading experts from universities, research institutes, and producing companies, this book assists materials scientists and engineers in the composites, automotive, textile and medical industries to more efficiently and effectively select fibers for a range of different applications areas. Dr Boris Mahltig is an expert in functionalization, finishing and composite fibres, based at the Faculty of Textile and Clothing Technology, Niederrhein University. He has many years of research and teaching experience in the area of high performance fibers. He has more than 110 publications in textiles. Dr Yordan Kyosev is Professor of textile materials, textile technology and quality management at the Faculty of Textile and Clothing Technology, Niederrhein University of Applied Sciences, Germany. He has extensive expertise in both braiding technology and mathematical modelling of braided products, and is the author of numerous publications on braiding and the 2014 title Braiding Technology for Textiles. He is also the main developer of the leading braiding CAD software, Texmind Braider.